In some ways, it's hard to envy Sanderson. For this penultimate novel of the series, he had to start wrapping up at least a dozen plot lines and convincingly moving all of the main characters (And armies. And nations.) to the spot of the Last Battle so that that Battle could be the focus of the final volume. That had to be tough. It's a credit to him that he managed it at all, let alone as well as he did. He managed to avoid a lot of the traps that Jordan started writing himself into like an abundance of politics. While there was some unavoidable politicking going on (most of the main characters are queens and emperors and lords, after all), Sanderson kept it to a very basic level. Part of that might be that the characters are all pretty powerful as rulers at this point so they wouldn't necessarily be forced to engage in the tedious Daes Dae'mar they used to gain that power. But I think Sanderson made the authorial choice to leave all of that behind. Unfortunately, while it may have been the lesser-of-all-possible-evils, that relentless focus on action also costs this book half a star from me. One of the things I like most about the Wheel of Time is the magic system. Sure, it gets a little expositionial at times but I've really enjoyed the more technical discussions of the One Power over the course of the series. This book skipped all that. When characters channel, magic just happens. It's fine, but it's a bit of a letdown since so much of the magic system in the series so far has been written directly to my taste. The other half star loss (compared to its predecessor, "The Gathering Store" which got 4 stars from me) comes from the breakneck pacing. As I noted, Sanderson was given the unenviable job of wrapping up 12 giant novels worth of plot lines. He managed it by speeding through all of them one after another. I didn't feel like I got to spend much time in the heads of anyone (with the possible exception of Perrin and somewhat less so of Mat). And that's a shame. But I suppose that's what happens when you have so many main characters: some are bound to get lost. I just think too many got lost this time around. 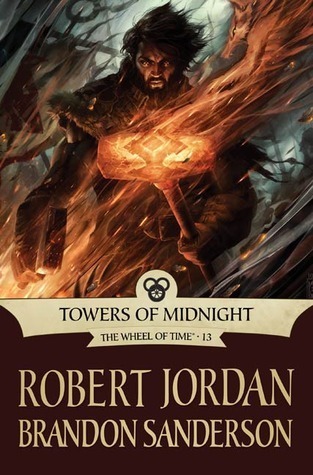 Sign into Goodreads to see if any of your friends have read Towers of Midnight.